The Ice Weird is the more solid version of the Snow Weird, water-influencing rather than air-influencing. 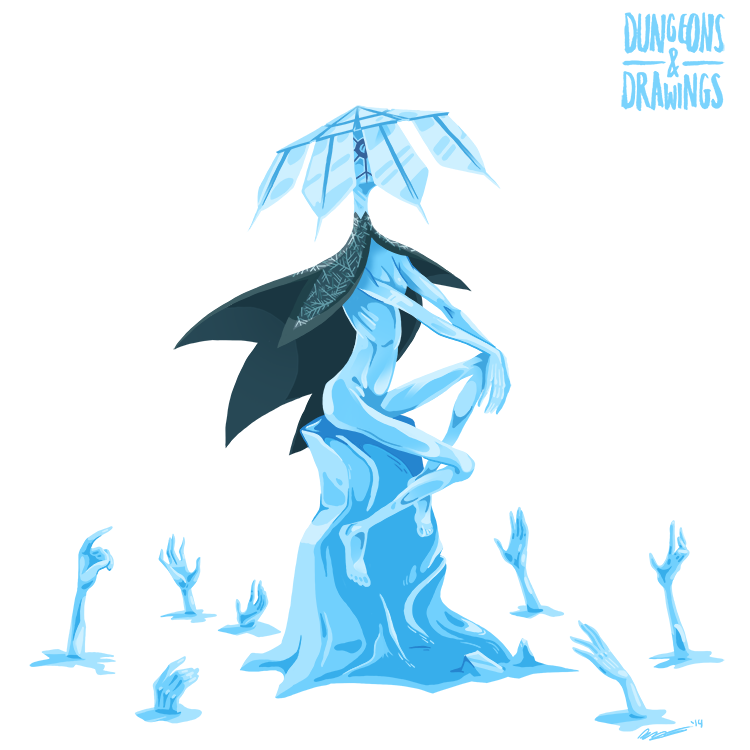 Like other Weirds, she's an especially powerful elemental tied to the mortal world by an elemental pool, a roiling mass of ice, which she cannot leave except to return to the Elemental Plane of Water, closing the pool behind her. Unlike the Snow Weird, she is unable to control the weather, her powers being more directed towards physical and mental handicapping. Trying to make the Ice Weird sufficiently similar from the Snow Weird was a pretty tricky challenge, especially since there were aspects with the first drawing that I was happy with, but didn't want to repeat too much in the second one. Also there were a couple of visual tropes related to snow women that I wanted to avoid, namely the icicle / snowflake crown and white hair. Also, despite the fact that she and all weirds are supposed to resemble human women, I wanted there to be something somewhat inhuman about her. Whether I was successful or not is up to the viewer, but I'm fairly pleased with the results. 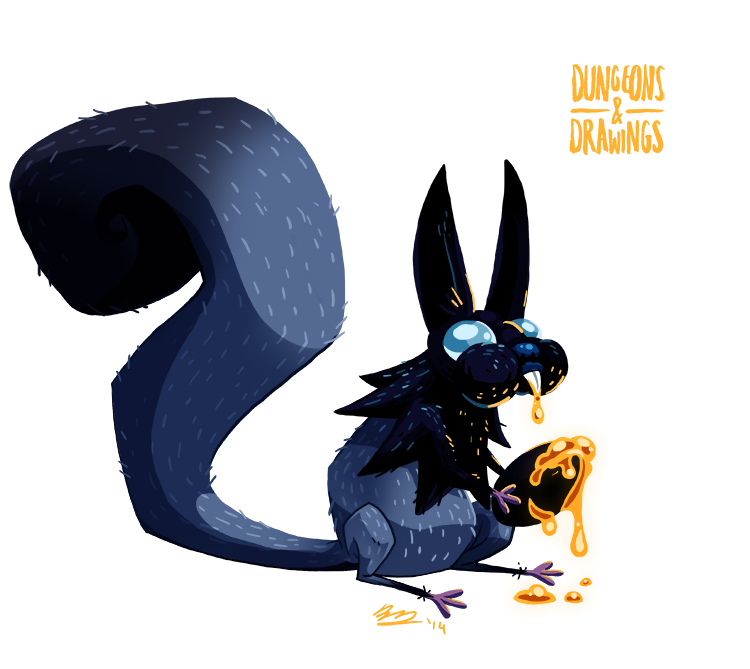 Yes, D&D has an evil squirrel. Part of the wildlife of the Shadow Plane, Skiurids usually live in colonies of up to two dozen individuals, along with their pups. Like other natives of their plane, Skiurids are capable of summoning magical darkness. The squirrels create cold areas of darkness, which drain the energy from anybody who happens to wander into them. That drained energy solidifies into a black nut, which the squirrels collect when the coast is clear. Their dens usually contain a small stockpile of nuts for pups and for rainy days. Skiurid energy nuts are coveted by necromancers, who use them to empower their spells. (In text rules, 50% chance of raising the caster level of a necromancy spell by 2). The thought of evil squirrels is pretty ridiculous, so much so that Skiurids are better suited for a comedy game. I can imagine evil squirrels in Adventure Time. Or if you just want to mess with your players. I think it works a bit better if you think of it a bit like the Elysian Thrush. Both are very low CR creatures that would probably only attack someone if directly threatened, but are capable of some fairly impressive environmental effects. For all your PC knows, they've just walked into a patch of darkness caused by some more threatening foe. And only if they make a fairly high perception check will they notice a little black squirrel picking something off the ground.